I’ve updated the Mobile Bookmarklets page at o.yeswap.com. It has over 40 tested mobile bookmarklets and instructions for using them. I’ve gone through the page and fixed bookmarks that were no longer working where possible and deleted the broken ones that I couldn’t fix. I also added a couple of new bookmarkets. Add to Gbookmarks – Updated to work with the currtent Google Bookmarks API. Add to Evernote – Fixed an error with the Evernote URL in the bookmarklet. Add to Buzzwire – Buzzwire.com appears to be dead. Bloglines Citations – Bloglines no longer offers the Citations service. Add to Bloglines – Saving a bookmark on the new Bloglines requires a POST request which doesn’t seem to be possible using a bookmarklet. Screenshot – The superscreenshot.com service has shut down and I haven’t been able to find a working replacement. Opera Mini 5/1 and Opera Mobile 10 have some bugs that can corrupt bookmarklets. See Problems With Bookmarklets in Opera Mini 5 Beta 2 for a explanation and workarounds. 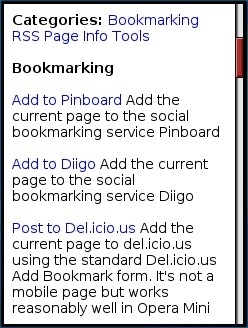 This entry was posted in Browsers and tagged bookmarklets, diigo, pinboard by Dennis Bournique. Bookmark the permalink.